There’s nothing like reaching for the remote only to find a cold, half-eaten banana smashed in between the couch cushions. OK? I have a penchant for baking things in a 9×5 loaf pan and I’m always looking for ways to use it. 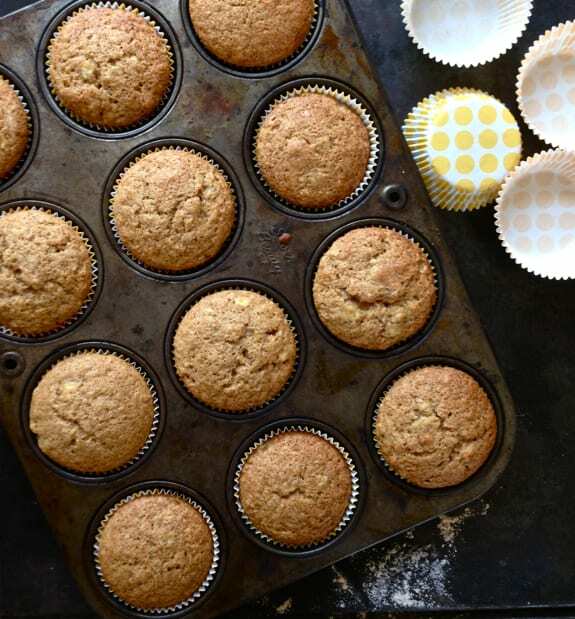 Whether it’s this recipe or any another, all banana breads require the same thing: overripe bananas. Overripe= good flavor, obviously. There’s no way around it. You’ll get a delicious end product full of banana-y goodness. This one is particularly moist and fluffy. As for the frosting, the Greek yogurt was not planned. It was one of those, I’m out of cream cheese quick throw in something else no one will notice kind of thing. There’s not a lot in there but it’s really good. Whenever I like a recipe, I usually make it a million times. I go through these mini obsessions if you will. As I write this, I’m staring at a mountain of 9×5 loaves that need to go into the freezer. Who’s squirreling now? *Have too many overripe bananas? Freeze them! Simply peel away the skin and wrap separately in plastic wrap. Freeze until ready to use. Make sure to thaw before using in this recipe. Frozen bananas are great for smoothies too. * If you do not have whole wheat flour, substitute with 3/4 c. of all purpose flour. Preheat your oven to 350 F. Lightly grease a 9×5 loaf pan and line with parchment paper (so that it sticks). Set aside. In a large bowl, whisk together all of the dry ingredients so that they are evenly incorporated. In another bowl, mash the bananas with a fork or potato masher until it looks like puree. You could also do this with an electric mixer. Add the sugar, eggs, and vanilla and mix well to combine. Slowly stream in the oil. Combine the dry and wet ingredients and stir gently until all of the liquid is absorbed. Do not over mix (the bread will be tough). Add the batter to the prepared loaf pan. Bake in the center of the oven for about 50-60 minutes. The bread is done when a toothpick comes out clean when inserted. Transfer to a cooling rack. Cool completely before frosting. To make the frosting, beat together the cream cheese and greek yogurt until smooth. Sift in the powdered sugar to avoid any lumps. Mix well to combine. Taste the frosting and add additional powdered sugar if you like it sweet. * This recipe will also make about 12 muffins. Bake for 15-20 minutes or until a toothpick comes out clean when inserted. That banana bread looks so delicious. 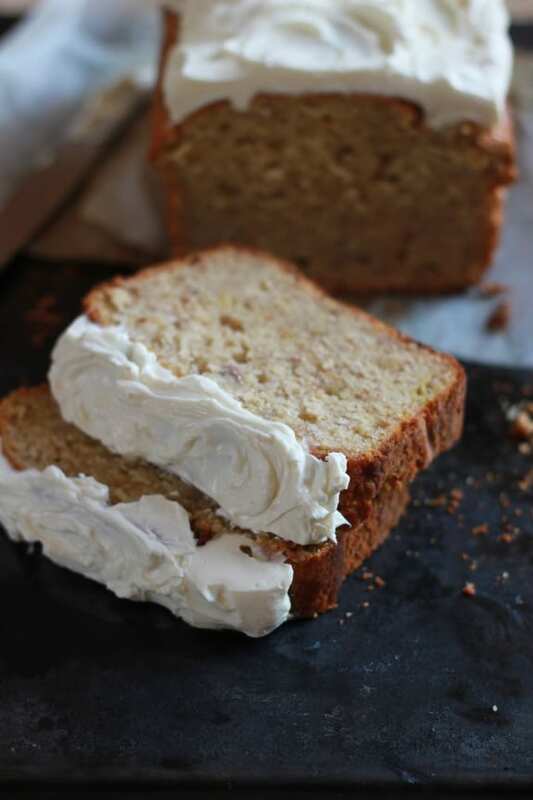 I have never had banana bread with frosting before but it sounds divine!!! You wouldn’t believe the stuff I find stashed away! I actually found a pair of reading glasses in the oven, OK? I opened the oven door and they literally just fell out! Oh man I have boys too so that made me laugh and cringe…ha-ha. What an inspired bread, love the Greek yogurt frosting! oooohh this banana bread looks so pretty (and tasty :)) with the frosting!! 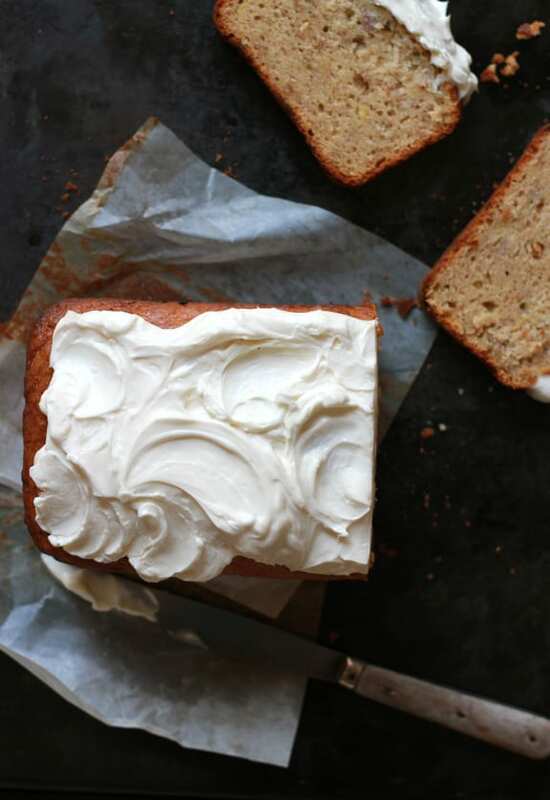 I never made banana bread with a frosting but I will definitely keep it in my mind and bookmark this recipe! Love it! Thanks Amy! You can make it with or without the frosting- it’s delicious either way! On a side note- I just read your ‘about’ section on your blog and girl, you got me laughing! I too love foreign grocery stores, Paris, avocados and most importantly JAMIE OLIVER! Sadly, here in NY I only get his old series…I watch all the new stuff on youtube! I love banana bread, it like a warm , yummy hug. Ha ha…it is, isn’t it? ;) I love it too! Love those swirls of frosting, the perfect finishing touch! Am making the banana bread and watching football too. I’m also making 3 batches of apple dapple bread, choc. chip cookies. I donated 4 months’ of desserts for an auction and am honoring my “contract” plus our apple trees PRODUCED big time this year! Just made the Banana Bread and it came out so moist and absolutely delicious! The only difference I did, since I didn’t have whole wheat flour, I used Almond flour. A perfectly simple and delicious recipe! Loved it. Thanks for sharing the recipe! My bread turned out great — was the hit at Easter Brunch! I tweaked the frosting a bit — only but about 1/3 c. of sugar (we don’t have sweet tooths) and juice from 1/2 an organic orange mixed in and some orange zest on top. Sounds fantastic! Love the orange ;) Glad you liked it Stephanie, thanks for the feedback! This banana bread is just so beautiful! I’d love to include your banana bread recipe in a banana recipe roundup I’m doing for Parade Magazine this month. 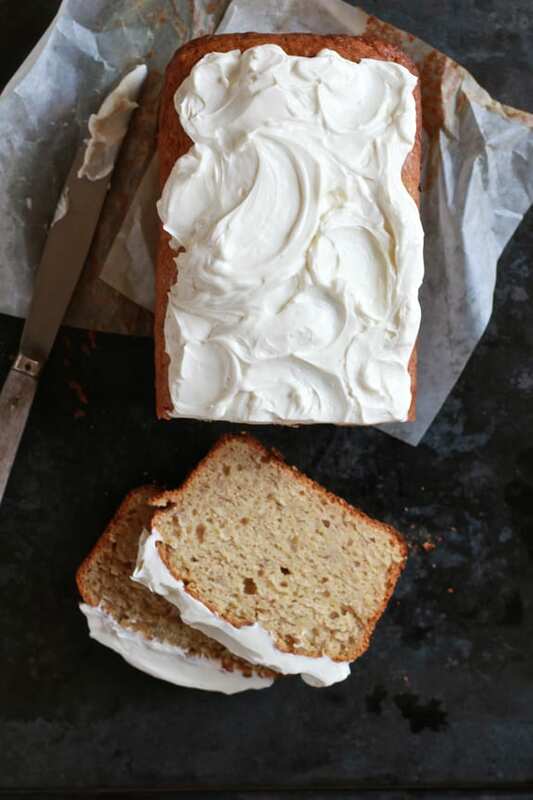 If you’re fine with that, could I use one of your photos with a link back to this original post (https://www.theclevercarrot.com/2013/04/banana-bread-with-greek-yogurt-frosting/). I just wanted to let you know that the banana roundup is published! 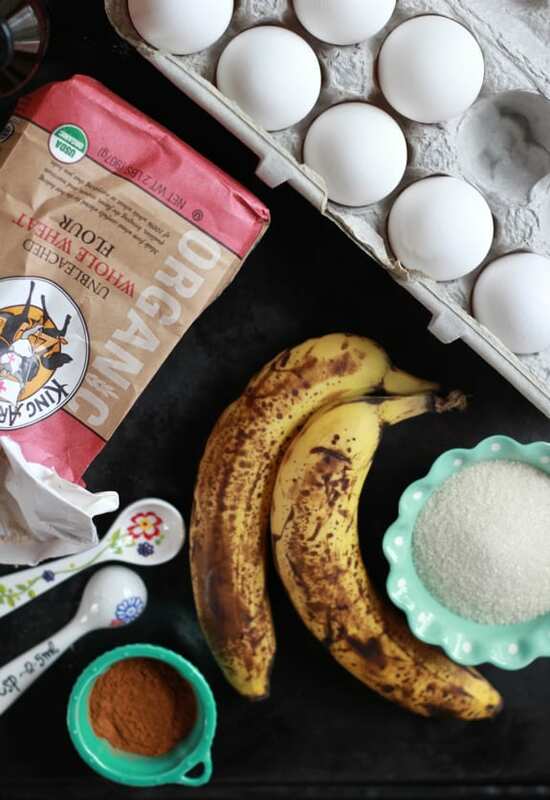 Thank you so much for letting me to include your banana recipe as part of the roundup! Is it 3/4 cups of flour x 2? If you have all purpose? It’s taken me two years but I’m finally going to make this recipe tonight ! I made this recipe last night as muffins, using Dannon Light & Fit Greek Banana Cream flavored yogurt. Oh. My. God. Amazing. Love this recipe! They were so moist too. Rave reviews at the office!! I don’t have cream cheese but I do have Greek yogurt, can I make the frosting without the cream cheese? I made the muffins version and they came out amazing. I used light olive oil for the oil and they are incredible. Best banana bread recipe I’ve ever made. I even used gluten free flour (Pamela’s). So light and delicious! Thank you!